But with spooky houses, a power outtage, and another big Tweets and Bobs family feud, will Lou and Dean be able to accomplish their task and win the contest? Find out in another spooky installment of Bobs and Tweets, this time with funhouses, new friends, and lots and lots of candy! This third book in the Bobs and Tweets series is filled with full-color illustrations and high-interest rhymes that's just right for reluctant readers. It's Dr. Seuss meets Captain Underpants wrapped into one zany Halloween adventure! 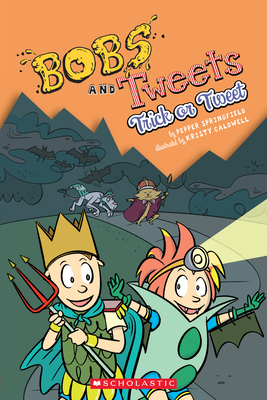 So go ahead, read and laugh and trick-or-treat with the Bobs and Tweets! Pepper Springfield was born and raised in Massachusetts. Pepper loves rock 'n' roll and chocolate, just like Lou Tweet. And, like Dean Bob, Pepper loves to read and do crossword puzzles. Over the years, Pepper has loved all kinds of pets: dogs, cats, hamsters, turtles, fish, a bunny, and an imaginary monkey. Pepper does not like the spotlight, but is always available to answer questions at pepper@pepperspringfield.com. Kristy Caldwell received an MFA in Illustration from the School of Visual Arts. She is a full-time illustrator and lives in New York, New York.